- at HD Cinema summer 2019! The Alexa Mini LF is ARRI's widely anticipated new camera with a 4.5K Large Format sensor camera. LF sensors offer more natural perspective and shallower depth of field when desired. Lower noise with higher sensitivity, high dynamic range, natural skintones and familiar color science. New HVF-2 high contrast viewfinder. LPL to PL mount adapter for both FF and Super35 lenses. ARRIRAW and Anamorphic 4:3 licenses included. 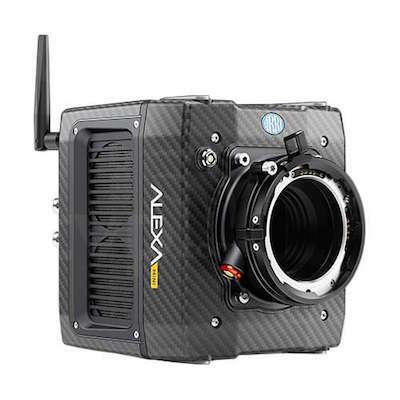 The Alexa Mini perfectly matches the images from all the S35 Alexas but in much smaller and lighter carbon fiber body. The Mini records a wide dynamic range to CFast 2.0 cards in ARRI Log C or ProResHQ. HFR high frame rates up to 200 fps. Our RED 8K Helium cameras record at Weapon speeds 60fps at the highest resolution compared to 30fps for the Epic-W.
Other HFR frame rates at lower resolutions: 96fps at 5K, 120fps at 4K up to 300fps at 2K 2.4:1. PL mount or Canon EF lens mounts. Redcode RAW and ProRes 4444 recording formats. The GEMINI 5K S35 sensor has exceptional low-light performance...imagery with less noise and better shadow detail. This sensor offers an increased field of view at 2K and 4K resolutions compared to the higher resolution HELIUM sensor. The Gemini sensor is slightly taller than the Helium sensor dimensions which works well with anamorphic lenses. 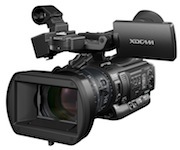 The Sony FS7 has the same Super 35mm CMOS sensor as the F5, amd uses the same XAVC codec so the images match. High frame rates up to 180fps. E-mount is standard, adapters are available for PL and EF mount lenses. The Canon C300 is configured with either a PL mount or Canon EF mount. HD Cinema has EF mount lenses including the Zeiss CP.2 primes, and Zeiss 15.5-45mm and 70-200mm professional cinema zoom lenses. The PMW-200 is the direct successor the PMW-EX1 and has a similar build with separate LCD and viewfinder. Using three 1/2" sensors, it records a higher data rate than the EX1 of the XDCAM format, 50 Mbs at 8-bit 4:2:2. The AG-3DA1 is a fully-integrated Full HD 3D camcorder that records to SD card media. The AG-3DA1 gives professional videographers a more affordable, flexible, reliable and easier-to-use tool for capturing immersive content. Copyright © 2018 HD Cinema Inc. All rights reserved.